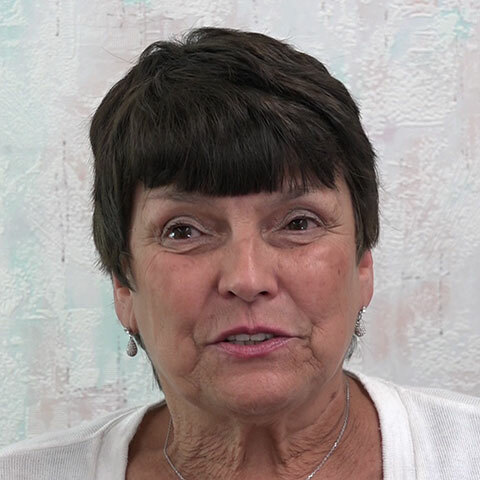 After her grandchildren asked her "do you have any upper teeth" this patient knew it was time for a big change to her smile. She came from Singapore to visit her daughter in Los Angeles and to find a dentist that could correct her bite so that her upper teeth would show. She had consulted with several dentists back home, none of which had the experience and skill required for complex bite reconstruction. The before picture shows bite collapse due to teeth wear and shortening of her natural teeth. 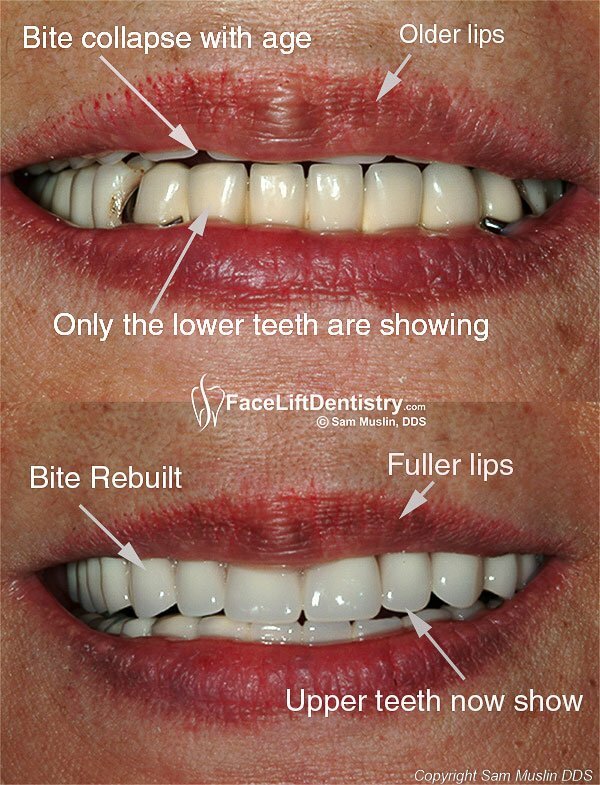 In the after photo her bite has been reconstructed resulting in a youthful and healthy appearance. Her entire bite had collapsed due to extensive wear and shortening of her natural teeth. This is a common result of aging that happens to everyone at varying degrees and at varying speeds. Our faces slowly drop under the hand of gravity and at the same time our teeth wear shorter every year. As such the upper teeth begin to disappear. 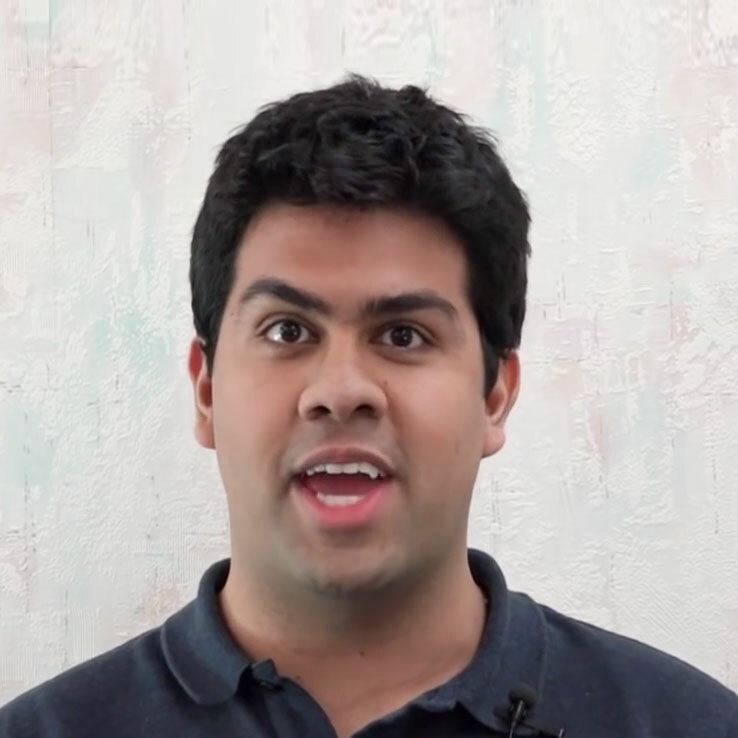 A more youthful look is to see primarily upper teeth when we speak and when we smile. She also had an existing porcelain bridge with metal clasps that showed which is obviously not desirable. She felt that her teeth made her look old. She wanted to have a natural smile free of metal clasps that allowed her upper teeth to be seen properly. This patient was 70 at the time of treatment. Her bite collapsed resulting in only the lower teeth being visible. The metal clasps securing her porcelain bridge is visible. In the after photo at the bottom, her bite has been rebuilt, resulting in fuller lips and both her upper and lower teeth are nicely balanced and visible. 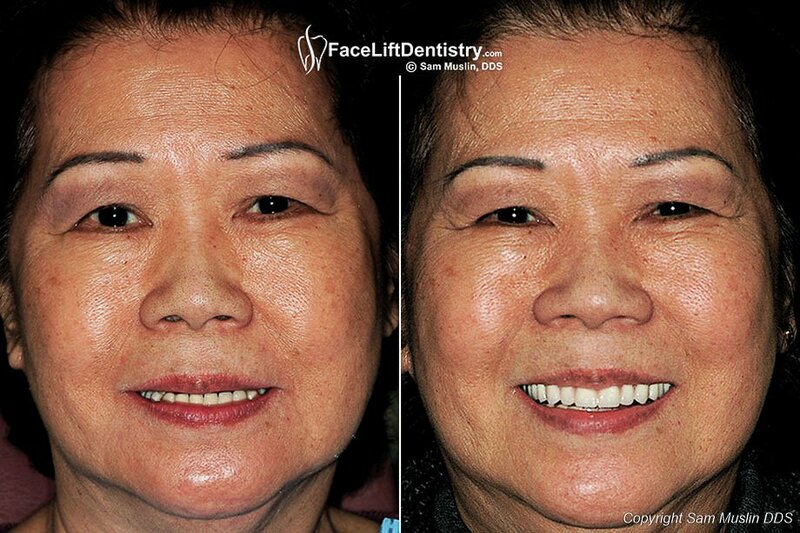 The only way to correct her bite, increase the presence of her upper teeth, and take years of her face was through Dr. Muslin's innovation Face Lift Dentistry ®. 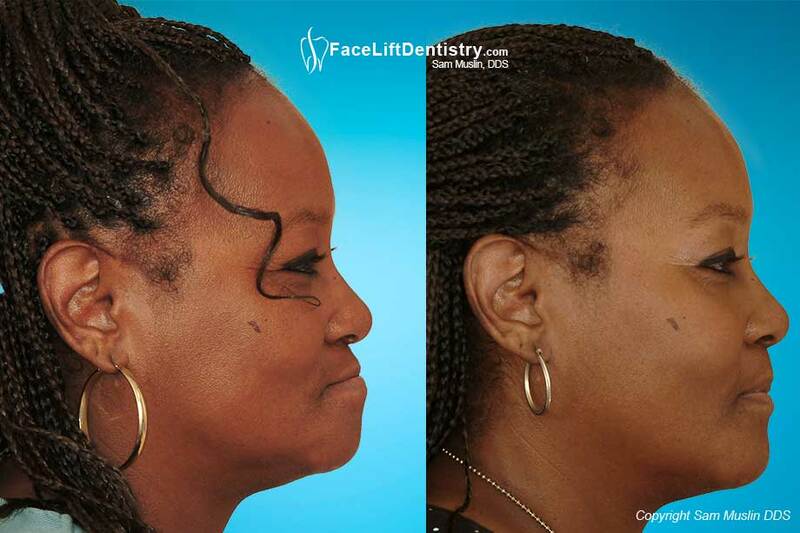 Face Lift Dentistry ® goes far beyond a full mouth reconstruction by actually optimizing your jaw position and therefore facial shape. Note that Facelift Dentures being offered in the market is not related in any way to Face Lift Dentistry®. In cases where dentures must be used, Dr. Muslin uses his own unique cosmetic dentures. Even when she smiles you can see that her upper teeth are completely hidden because they are so short. The shortness of the teeth also affected the shape of her entire face by making it rounder. Many people do not realize that extremely short teeth causes their jaw to be shoved back which can cause jaw pain, headaches, and TMJ. Each tooth was re-shaped and custom designed by Dr. Muslin to change her bite. 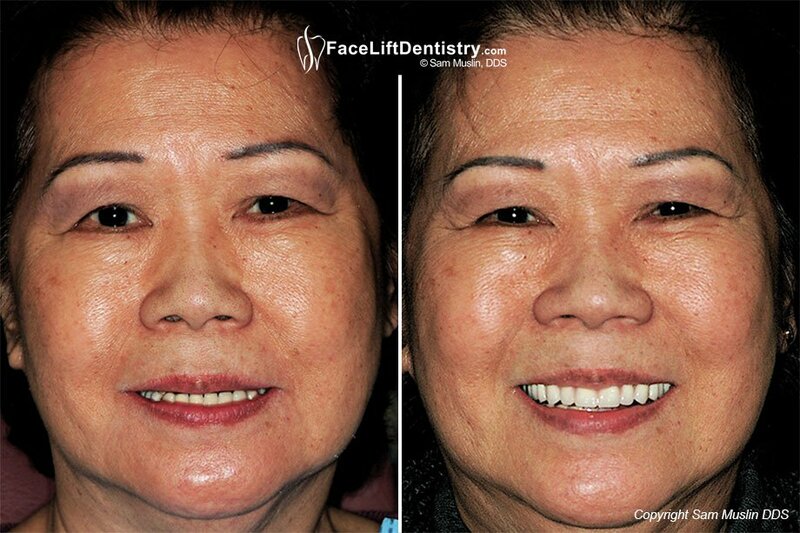 The entire Dental Facelift® treatment took only 4 primary visits. While she vacationed southern California her custom teeth were being perfected, tried in her mouth, modified and personalized to her particular facial features and eye color. 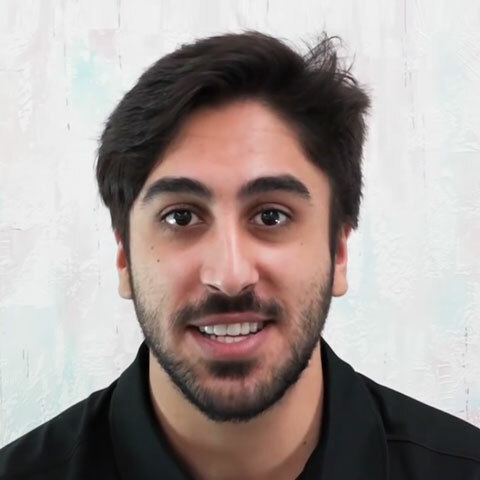 Dr. Muslin uses the white color of your eyes as a guiding tool for selecting the white color of your teeth. When the two whites match your entire face will appear balanced and in harmony. Too often teeth are created that are extremely white or that lack the anatomical features that make the crowns or bridge look real. 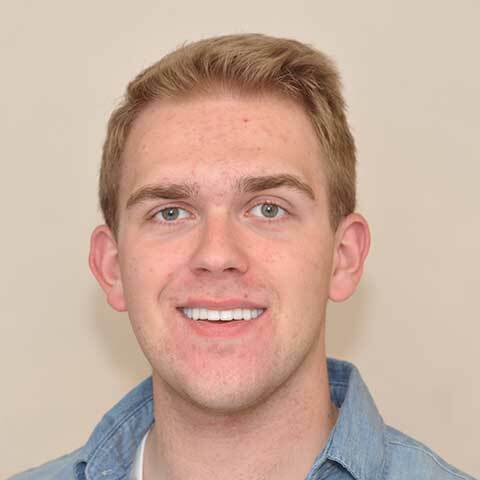 Dr. Muslin concentrates on creating very natural looking teeth and a dream smile for each individual and this patient was no exception. She wanted to make sure that her look was believable so you will see slight translucencies throughout the teeth. Note that the porcelain teeth are not all the same length and shape because natural teeth are not all exactly the same either. Finally Dr. Muslin designed slight shade variations in the color to make the restorations as believable as possible.